One of the things that I love about living in Serenbe is the amount of creative energy flowing through our growing community. One of our soon-to-be residents, Jill Sharp Brenson is featured in the December/January issue of House Beautiful. She has an amazing flair in mixing different elements together in her home to create a warm inviting atmosphere. What I love most is that her style is “elegantly simple”. See the entire story featured in House Beautiful. Jill is the Creative Director of Ballard designs. She and her husband Rob, who is a photographer in Atlanta plan to build a home in Serenbe in the coming year. 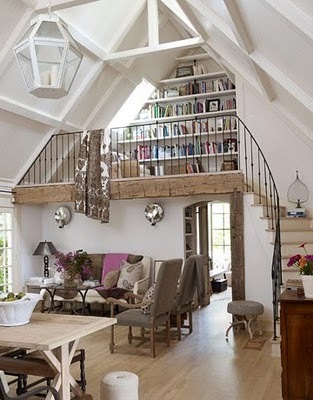 This room is so lovely, where would I begin to say all I love about it. 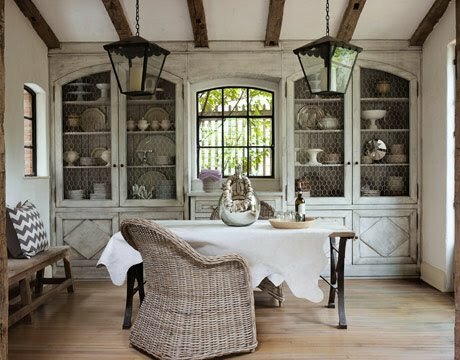 From the rough, salvaged beams to the wall cabinets with chicken wire, and the lanterns……the mixture of elements is absolute perfection. Jill has also designed 4 exquisite townhomes featuring wonderful limestone flooring, wood doors from France and natural and eco-friendly finishes throughout the homes. These are all in our plan to be built in Serenbe and are some of the most beautiful homes I have seen.